In addition to developing software tools for grassroots civil society organizations (CSOs) in developing countries, Envaya also develops software tools for the larger NGOs, foundations, and development agencies that fund and support CSOs. Envaya works in collaboration with development agencies and foundations to design, implement, and deploy software-as-a-service solutions that help them achieve their goals, while profoundly increasing visibility and transparency within the development sector at the grassroots level. 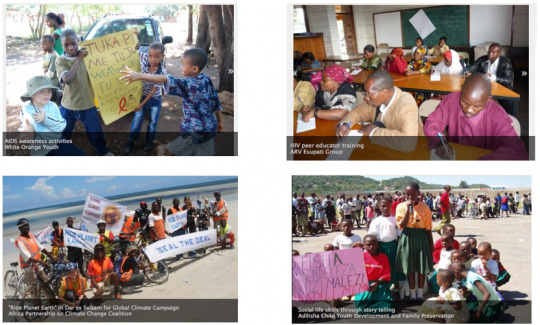 In the sections that follow, this page describes and explains the services that Envaya provides to development agencies and foundations that serve the civil society sector in developing countries. If you represent an organization that is interested in better software tools to meet your goals, we encourage you to contact us at info@envaya.org. Development agencies and foundations fund some amazing work in developing countries. However, even the highest capacity grantmakers often have a difficult time showcasing the success stories of their grantees. Envaya's software tools give these grantmakers an easier way of highlighting the real on-the-ground impact of their funding. As CSOs on Envaya publicize their progress online, their funders can share in the project successes. Photos, updates, and success stories posted directly by community stakeholders are powerful, accessible, and undeniable. As part of our effort to increase development efficiency and transparency, Envaya has built a custom, flexible electronic monitoring and reporting platform that allows grantmakers to collect structured reports from their grantee organizations. Envaya's reporting platform provides grantees with a special feature set on envaya.org that allow them to submit reports to their funder directly online. Grantmakers, in turn, have an administrator interface that allows them to view, approve, and manage reports online, and access analytics and data aggregation views. Envaya's reporting platform is powerful and flexible, designed to be customizable for the specific reporting systems of each of our grantmaker partners. Envaya recognizes that most grantmakers already have existing reporting processes and requirements. Envaya's platform allows the grantmaker to maintain its current reporting requirements, while helping them transition to a more efficient process. With Envaya's reporting platform, grantmakers can avoid the many inefficiencies of paper forms, while also reducing their internal need for internal database management expertise. As Envaya's reporting platform is implemented as software-as-a-service (SaaS), the complexity of hosting and maintaining the software, web servers, and database systems is handled entirely by Envaya, freeing grantmakers to focus on their program activities. However, whenever grantmakers need to use their own software or third party systems, Envaya's reporting system makes exporting reporting data easy. Envaya's reporting platform allows submitted reports to be easily and transparently published on the internet, while also giving the option for reports to remain confidential when necessary. This system is designed to encourage transparency to a degree at which both grantmaker and grantee are comfortable. 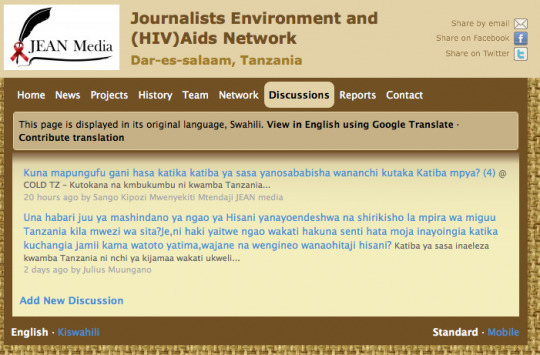 Envaya's reporting platform has been deployed in Tanzania in a partnership with the Foundation for Civil Society (FCS) since January, 2011. 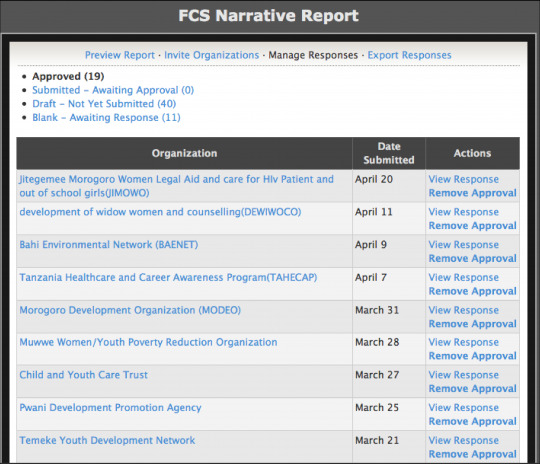 Envaya's systems enable FCS to electronically track its grants to CSOs and transparently display results, data, and successes on the internet. Envaya works diligently to make sure our reporting platform readily meets the needs and challenges of CSOs and grantmakers in developing regions. In response to feedback from some CSOs who found it inconvenient to maintain an internet connection while completing a report, Envaya has developed a lightweight desktop application that allows users to complete reports entirely offline. When the users later reconnect to the internet, they can seamlessly upload their responses to envaya.org with a click of a button, or email them to the grantmaker. Envaya's offline reporting application even allows reports to be distributed to, and submitted by, CSOs without any internet connection by physically transporting the software and data files. By incorporating Envaya’s technological advancements (optimized software for low-bandwidth connections, ultra-fast image and document uploading, content translation services, easy-to-use interface for new internet users, offline support, etc. ), and working directly with grantmakers to customize the platform based on their reporting needs, Envaya's system offers grantmakers and grantees a seamless and powerful opportunity to make monitoring and reporting processes far easier, more efficient, and more transparent. Grantmakers can leverage Envaya's advanced tools and rapidly growing online network of CSOs to find and evaluate potential new grantees, and monitor current grant recipients. Grantmakers can use Envaya's tools to automatically identify CSOs that fit funding initiatives, read full profiles of CSOs, monitor CSO recent activity, and even read past funding reports to other grantmakers. Envaya also provides advanced tools to grantmakers for more efficient and direct engagement with CSO grantees beyond monitoring and reporting. Capacity building is a large component of development, so Envaya offers grantmakers easy and powerful tools to share knowledge and spark discussions among their networks of grantees. On Envaya, CSOs can easily establish networks and online discussion forums that enable them to engage with a variety of geographically distributed stakeholders, including their grantmakers. Envaya's networking and discussion tools are optimized for ease-of-use in developing, low-connectivity regions. User generated content is auto-translated, allowing users to communicate in their preferred language, while remaining accessible to people who are not fluent in that language. Coming soon, Envaya discussion forums will be entirely cross-functional across email lists and Yahoo/Google groups, allowing CSOs that already use a particular forum to continue using their existing tools while integrating it into their presence on Envaya. All of Envaya's software is built in direct response to real needs of our users. If you represent a development agency or foundation, and are interested in better tools to meet your goals, we are eager to work with you! Please contact us at info@envaya.org.